The Marching Virginians are proud of the fine work they accomplish both on and off the field. Whether collecting canned goods for the Montgomery County Christmas Store, performing at the local retirement community Warm Hearth, or partnering with St. Jude's Children's Research Hospital, The Marching Virginians are truly The Spirit of Tech. Each year, The Marching Virginians sponsor a massive food drive for the Montgomery County Christmas Store. The Christmas Store collects food, clothing, and toys for low-income citizens to buy at Christmas time on a point system. This fundraising project started as a small Tau Beta Sigma service project in 1997, but has grown into a huge event. Each year a celebrity spokesperson is selected (usually a star football player) and the event is advertised on the VT homepage, hokiesports.com, on the radio, and through local news outlets. An announcement for Hokies for the Hungry has even been printed on VT football tickets! On the day of the event, The Marching Virginians split up into pep bands that travel throughout the tailgaiting lots, performing and collecting donations from fans before the game begins. The MVs have joined forces with the New Life Christian Fellowship (NLCF) to make this event even more successful. NLCF volunteers collect donations after the band enters the stadium and load the truck that will carry the donations to the Christmas Store. Thank you, NLCF! Each year, thousands of dollars and canned food items are collected to feed families all over Montgomery County. 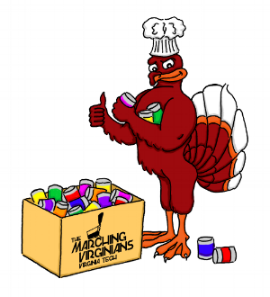 The MVs appreciate all of the news outlets and organizations who help to make Hokies for the Hungry such a huge success every year. Since 2006, The Marching Virginians have proudly participated in Band-A-Rama, an event to celebrate all things band at Virginia Tech. Joined by the University's Symphonic Wind Ensemble and Jazz Ensemble, the MVs perform show music from their season and other popular songs from their repertoire. Plus, it's the only time you'll probably ever experience the MVs indoors! Proceeds from the concert support Virginia Tech's student music activities. In the fall of 2005, a special performance request came from a high school in Southwest Virginia. Craig County High School is one of the smallest schools in the state, and they didn't have a band program to play for their football games. A small pep band traveled down the windy road from Blacksburg to New Castle, and they were met by a whole town who had come out to support their team. The excitement was infectious, and since then the MVs have made this performance an annual event. Let's Go, Rockets! Since 2012, The Marching Virginians have been actively involved with fundraising events for organizations such as the ALS Association and St. Jude's Children's Reseach Hospital. The band has raised over $50,000 for these organizations, and dedicated halftime at the 2017 Duke Game to St. Jude's. In 2014, MV Director David McKee challenged Virginia Tech fans and other bands to the ALS Ice Bucket Challenge. This event raised over $11,000 for the ALS Association. Dave kept his promise and posted the video online. In September of 2017, The Marching Virginians participated in a special pep rally at Warm Hearth Village in Blacksburg. While the pep rally was advertised as a resident appreciation activity and 25th anniversary celebration, the event also served as a tribute to Tony Distler - an active board member for WHV and voice of The Marching Virginians, who had passed away the previous year. The Marching Virginians were honored to bring their spirit and energy to the residents of WHV and to participate in such a wonderful celebration of Tony's work. In 2011, The Marching Virginians joined forces with LewisGale Hospital Montgomery employees, breast cancer survivors, and the Virginia Tech Spirit Squads to create an original dance video for the Pink Glove Dance Competition. The video is set to Pink's "Raise Your Glass" and features scenes from the hospital and Lane Stadium. The video received over 19,000 votes from fans, and came in 4th place overall. Since 2010, the band has held numerous blood drives for the Red Cross. Several of these drives were held as competitions with Georgia Tech's Yellow Jacket Pep Band. On Monday, May 11th, 2009, The Marching Virginians began work to fulfill their promise to build a house in honor of Ryan "Stack" Clark - the MV baritone player who lost his life in the April 16th shootings. This house was an exciting collaboration between the MVs, the Town of Blacksburg, and Community Housing Partners Construction was completed on May 21st, 2009 - a full day ahead of schedule, and a dedication ceremony was held on Saturday, June 20th with Ryan's family in attendance. Click here to view an album of photos of the house and the event. In November of 2005, the popular ABC television show Extreme Makeover: Home Edition selected Blacksburg resident Carol Crawford-Smith and her two sons, Hunter and Garland, for an extreme makeover. The Blacksburg and Virginia Tech community – including The Marching Virginians – immediately joined forces to help. Carol Crawford-Smith, who suffers from multiple sclerosis, was a dance instructor whose cheerful spirit helped her overcome countless obstacles in her life. As her health deteriorated , one of the greatest obstacles in her life had become her house. Filled with small steps throughout, a simple trip from the bedroom to the kitchen had become a long and painful journey. Just as difficult, the trip to her second-floor Center for Dance studio posed an even greater challenge, taking almost forty-five minutes to accomplish the twenty-two steps. It was clear that this mother and dance instructor needed the help of Extreme Makeover: Home Edition. On the morning of demolition, The Marching Virginians rose to the challenge in their own unique way. Led by TV host Ty Pennington, The Spirit of Tech paraded hundreds of maroon and orange clad students and demolition workers to the building site. Even though band members had just returned from the ACC football championship game in Jacksonville, their energy and enthusiasm overcame the freezing temperatures and newly fallen snow that morning. As the MVs danced The Hokie Pokie on the front lawn, they knew they were doing something great in the community. The producers of Extreme Makeover said that the Crawford-Smith house involved the most volunteers the show had ever seen. With over 4,000 volunteers, Extreme Makeover created a house for the Smith family that accommodated Carol’s illness. They also altered her studio so that she could continue to teach and share her love of dance with her students. The Marching Virginians are proud to have been a part of this amazing project. The Marching Virginians teamed up with YMCA at Virginia Tech on two separate occasions to send students to New Orleans to help with cleanup and restoration in areas that were destroyed by the 2005 hurricane. On the first trip, which took place in 2005, students spent their Thanksgiving break cleaning out ruined houses and disposing of damaged furniture and other debris. Many generous donations supported the 35 MV and 19 YMCA volunteers, providing them with most of the food and gear they needed to make it through the week. The students slept in a nearby church and even enjoyed a Thanksgiving Day meal with members of the community. On their second trip, which took place in November of 2007, the theme of the trip was repair and restoration rather than destruction and demolition. Students spent their time painting and installing flooring in rebuilt homes. Another type of healing also took place that week as one of the homes was dedicated to Leslie Sherman and Ryan "Stack" Clark. Both of these students were victims of the April 16th shootings who had previously traveled to New Orleans for Katrina relief efforts, and Ryan was a Marching Virginian. Hokie stones with their names were placed on the property and a special ceremony was held. It was a lovely tribute for two hokies who were the embodiment of Ut Prosim.